Twitter users have on more than one occasion invented their own new functionality for the microblogging service, and the developers have often taken the conventions and integrated them into Twitter’s core feature set. Originally the @reply concept was just that: a user-developed practice that evolved to fill a need. Twitter later adopted the standard and made it official, with reply tracking and other neat features. The same thing happened for hashtags. People would append #sometag to their postings to make it easier to find event-specific tweets via searches. Twitter eventually acknowledged the practice and picked it up. Now the same thing is happening to retweets. A retweet, in case you’ve been living in a cave without WiFi, is a convention that the Twitterfolk came up with in order to share a tweet with their own sets of followers. You copy and paste the tweet, then append “RT @username” to attribute it to the original author. It’s fairly simple, and surprisingly effective. A retweet can virally spread pretty fast under the right conditions. But now everything is about to change. With “Project Retweet,” Twitter’s official built-in retweet function rolled-out to everyone, the retweet is about to get a lot more interesting. 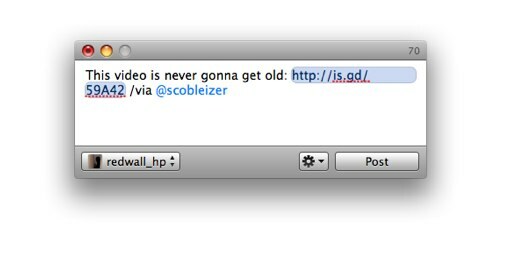 Now you can retweet a post simply by clicking a button. That’s all you have to do now. The original tweet will be added to your timeline, and displayed in a manner that attributes the tweet to the original author, while showing that you were the one who retweeted it. It’s easier, and a lot cleaner. You’ll only see a retweet once, instead of being inundated with the same repost from different users. I agree with the sentiment that there should be a way to add commentary in certain instances. The solution, however, is not to continue using the old method of retweeting, continuing the problems clutter and unreliable attribution. The solution is new syntax. Meet “slashtags,” a concept put forth by the creator of the hashtag. There’s more though. You can /cc someone or use /by to attribute a quote taken from some other context to someone. Go and read up on the proposed “slash syntax” to see the full power of it. Twitter is a living medium that evolves over time, and right now you can see it trying to adapt and improve. We’re in a transition period at the present, as many Twitter clients haven’t implemented the new retweet feature yet, so we’re still getting a sea of old-style “RTs,” but eventually everyone will be using the retweet button and /via for cases where a retweet isn’t appropriate. I don’t like the new RT setup. I didn’t think anything was wrong with it before. I’m the type that if it ain’t broke, don’t fix it. Well, a lot of people thought it was broken. (I’m kind of split on the matter.) Twitter can’t please everyone, and in the end there isn’t too much option but to go the direction they want. My biggest problem is that Twitter is trying to move everyone toward the new retweets, but people using desktop/phone clients often can’t see or post them properly, so we have two groups of people doing different retweets. 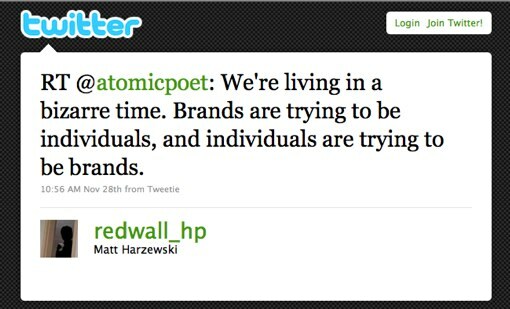 If I use the iPhone version of Tweetie, or Twitter.com, I can see all of the new-style retweets and post my own. But if I use the Mac version of Tweetie, I can’t see or create them. (And just imagine all of the other applications that haven’t updated yet!) It’s frustrating, and a bit confusing. This Is starting to look like programming code or those HTML tags. I’d say it’s more like the chat commands in IRC, first-person-shooter games, or World of Warcraft. /dance, /ignore, etc. RT is a good idea but maybe not for everyone all the time. Why not have a block RT’s button or a block RT’s setting in Twitter? That’s one of the major benefits of the new retweeting system. You can, on a user-by-user basis, opt to not see retweets. For example: If a few people you follow like to retweet @redwall_hp (which I encourage, of course ) but you don’t ever want to see my tweets, you can choose to have my tweets not be displayed to you. It’s kind of like following/unfollowing, except you’re automatically “following” retweets by default. I’m not sure what is NEW about this idea? I almost always use via and reword things I pass along most of the time and have been doing so for a year. 1. It saves one of your precious 140 characters. 2. The slash concept allows for the /by and /cc things. Other than that, it’s not really a new idea. The concept is the same, and one that I greatly endorse. The old “RT” needs to be abandoned as soon as possible to make things less confusing for everyone, and to make the great new features coming with Twitter’s new retweets work well.